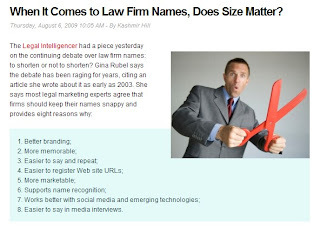 I received an e-mail for a colleague telling me that my blog on law firm names from The Legal Intelligencer was quoted on Above the Law. For those of you who aren’t familiar with AboveTheLaw.com, their site says this: AboveTheLaw.com takes a behind-the-scenes look at the world of law. The site provides news and gossip about the profession’s most colorful personalities and powerful institutions, as well as original commentary on breaking legal developments. Above the Law is published by Breaking Media. It’s considered the Huffington Post or Drudge Report of the legal industry. Kashmir Hill is the associate editor for the “legal tabloid” (their words not mine). Hill quoted my eight reasons why I believe shorter is better – in the context of law firm names. She then went on to applaud Morrison & Foerster for using MoFo calling it simple and brazen. It certainly provides fodder for what comes next. After giving a few examples, contributors came up with a few of their own. They are a hoot to read – although if you find sexual innuendos and opinionated commentary a waste of time – then you should avoid the comments altogether. #120 – whoever you are – thank you for the accolades. I’m honored. And speaking on behalf of those legal marketers who have practiced law, managed law firms and kicked A$$ in legal communications by averting crises, garnering national media attention, keeping clients out of the media when necessary, advocating on behalf of the unknown to influence key thought leaders, increasing revenues, and building brands and businesses – I thank you!